If you are missing teeth or have damaged teeth, dental implants are a great way to permanently replace the teeth and restore function to your smile. Doctors and patients alike prefer dental implants to other tooth replacement methods because they are sturdier, longer lasting, and function more like natural teeth, giving you the confidence to go about your life as though you were never even missing a tooth! 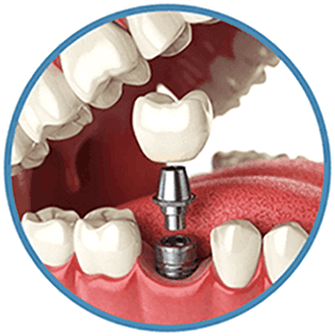 A dental implant is a state-of-the-art dental treatment that replaces an entire tooth, down to the root, with a durable, permanent titanium post that anchors and fuses with your jaw bone. This creates a stable and reliable foundation for a restoration – typically a dental crown, bridge, or denture – that will match or even surpass the strength of your old tooth. If you have one or more missing teeth, dental implants offer a number of benefits over removable appliances, including preventing bone loss, anchoring dentures, and more. When taken care of properly, your dental implants can last up to 15 years or longer. You should maintain a comprehensive at-home dental hygiene routine by brushing at least twice per day, flossing daily, and rinsing with a fluoridated mouthwash. While dental implants are considered a permanent solution for tooth replacement, our mouths do change over time. It’s important to regularly attend your biannual professional cleanings so we can inspect your implants and detect any complications early on. What are the long-term effects of dental implants? One of the most notable long-term effects of dental implants is that they support your jawbone health. Implants serve as replacement tooth roots which support your facial structure and make eating and speaking significantly easier. At Texas Dental, we have many payment options for your San Antonio dental implant treatment. We accept third-party financing through CareCredit and Lending Club. Both options give you the freedom of monthly payments, which allows you to get the treatment you need right away. When taken care of, dental implants will last a lifetime, so they are a cost-effective solution for replacing missing teeth.